The Internet, mobile technology, the ubiquity of information and the availability of big data have dramatically increased the speed and impact of success and failure. Companies today know that they must be competitive, but precisely where, and more importantly how, to compete is not always easy to identify—until now. 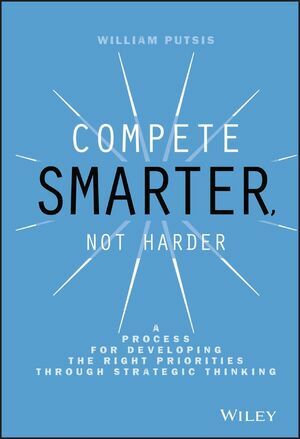 Compete Smarter, Not Harder explains how to prioritize market opportunities so that a company's strengths in one area can be leveraged across multiple markets. Using cutting-edge academic research and extensive industry practice, author William Putsis outlines the strategic decisions needed to determine which space provides the best margins, overall profitability, and growth potential. Prioritize with conviction. Make absolutely sure that all of your hard work goes toward the right space. DR. WILLIAM PUTSIS is a Professor at the University of North Carolina at Chapel Hill Kenan-Flagler Business School specializing in the areas of Marketing, Economics, and Business Strategy. His scholarly work has been published in various journals, including the Journal of Marketing Research, Marketing Science, Journal of Business, Journal of Business Research, Managerial and Decision Economics, Marketing Letters, Applied Economics, Journal of Forecasting, and the Review of Industrial Organization. He is also President and CEO of Chestnut Hill Associates, a strategic consulting firm he founded in 1995. The process presented in the book has been developed over the past two decades of working with organizations of all sizes including many leading Fortune 500 companies.